Belfast, 1985, and Detective Inspector Sean Duffy of Carrickfergus CID seems to be spending more time maning riot lines than investigating cases. Teetering on the edge of burnout he backs his sergeant in a dispute over the jurisdiction of a double murder of a rich bookmaker and his wife. Solving it will aid McCrabban’s career prospects and it seems like an open and shut case, especially after the son commits suicide leaving a confession note. Duffy, however, is not convinced, especially when he discovers that Michael Kelly dropped out of Oxford after attending a party where a cabinet minister’s daughter died of a heroin overdose, and Kelly’s best friend has just been sacked from Shorts factory, where six missiles have gone missing. Then there’s another murder, followed by political pressure to drop the case. Ever dogged, Duffy and his team stick to their task, determined to discover the truth. 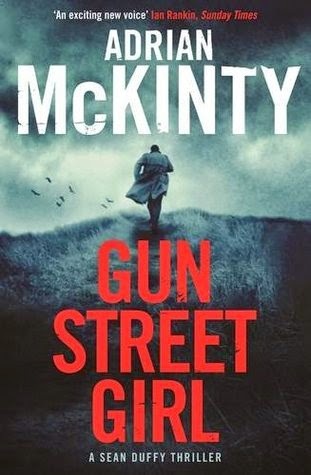 Gun Street Girl is the fourth book in Sean Duffy series set in Northern Ireland in the 1980s. Duffy is an appealing character, a perennially out of place Northern Irish cop blessed with mordant wit and a self-destructive streak. Add to this McKinty’s ability to conjure up the sense of time and place and to thread his stories through the real scandals of the period (which given its politics and conflicts, Northern Ireland has in abundance) and you have a very attractive mix. The wider context in Gun Street Girl is the disappearance of six Javelin missiles from Shorts Factory in East Belfast. Narrow margins a theme that runs through the book. At the start, Sean Duffy’s sergeant takes on a murder case as it just about falls into their jurisdiction and Duffy is teetering on the edge of burnout and leaving the RUC, and the book closes with a very nicely judged pair of close shaves. It was always going to be difficult to top Duffy’s last outing, In the Morning I’ll be Gone (my book of 2014), given its clever story within a story, and whilst Gun Street Girl is an engaging read it lacked the same edge, tension and political intrigue that ran throughout its predecessor. It is nonetheless, a very decent police procedural that really sparks to life in the final couple of chapters as it nears its double denouement, both of them with a nice bitter twist. 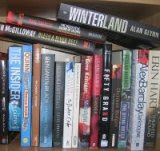 As usual, McKinty’s unique prose style shines throughout. It’ll be very interesting to see where McKinty takes Duffy next in what is an excellent series. As an afternote, I wish Serpent's Tail would stop using the Ian Rankin quote of 'An exciting new voice' on the covers of McKinty's books. Yes, an exciting voice, but he's well into double figures at this stage, is pretty well established, and is far beyond 'new'.